Owl Time Clock's all-in-one Swipe Card Systems streamline your payroll process and with the software right in the box there's no installation required. TotalPass Proximity is a premium employee time and attendance system that gives business owners an effective tool to manage payroll costs and optimize performance. TotalPass Small Business Proximity can accommodate 50 employee capacity, upgradeable up to 500. PIN/keypad entry, proximity badge entry with 15 badges included, and Web browser entry with 5 employee licenses included. Exports seamlessly to a CSV file and these popular payroll programs: Paychex FlexSM, QuickBooks Pro, Premiere and Enterprise, and ADP desktop software. Free API available, to create custom exports. Run Labor Distribution Reports based on custom values assigned to an employee such as; assigned location, billing account, work status etc. Clock in the Box™ for Small Business is an all-in-one employee Swipe Card System that streamlines your payroll process and automates employee time tracking, with 24/7 web access to the data. Owl Time Clock, aside from time tracking software, also offers a wide selection of data collectors and time clocks, from traditional punch clocks to the latest in biometric terminals. Browse through our website to find the Swipe Card System that’s right for you, or contact us today for a consultation and needs-analysis with one of our workforce management specialists. With Clock in the Box™, managing your payroll is as easy as surfing the web! The name says it all: Clock in the Box™ from Owl Time Clock is a complete employee time tracking software solution with software and hardware right in the clock—no software to install! Now you can view and edit employee time punches and prepare payroll via any Internet-connected computer, enabling access to this data anytime, from anywhere in the world. Clock in the Box™ comes with everything a small business needs to start collecting punch data and saving time and money now! When your business needs become more complex, upgrade to Clock in the Box™ Pro. This comprehensive employee time-keeping solution, complete with software and hardware, is easy to install and learn, yet is robust enough to handle more challenging time and attendance needs. 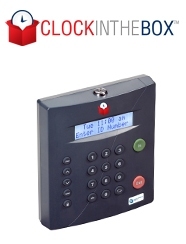 Pair Clock in the Box™ Pro with Biometric Hand Punch for the ultimate Time and Attendance solution. timeQPlus™ Proximity is a complete Swipe Card System with the capability to read proximity cards for up to 50 employees. The software included in the package lets you handle weekly, biweekly, semi-monthly and monthly pay periods including up to 12 shifts and has job costing functionality. With the software, you can edit employee punches, view reports and export data to a host of third party payroll programs. One of the key benefits of timeQPlus™ is the possibility of toggling from one language to another within the software. Languages supported include English, French and Spanish. Perfect for small business with easy to setup PC software and a terminal that connects directly to your PC, timeQPlus™ is also scalable with a 25 user upgrade and options that can handle up to 250 employees. Make every minute count on your payroll with a timeQPlus™ Swipe Card System! 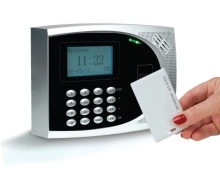 Pair timeQPlus™ with Biometric Hand Punch for the ultimate Time and Attendance solution.